GreenLine Paribahan is a family owned transportation company. The company operates its transportation business since 1990. The company owned best bus service prize for four years 2009, 2010, 2011 and 2013. They provide their services for all reachable places of Bangladesh. Even they provides their services for international level crossing our border to Kolkata in India. Green Line Paribahan first brought AV bus service in the transportation business in Bangladesh. Green Line Paribahan has the best bus service with VOLVO, SCANIA, and MAN bus. The buses are imported from Europe to give the passenger's world-class safety and luxury. All the buses are fully air-conditioned to provide ultimate comfort and safety to the passengers. The company has more than sixty buses now. More than 200 trained stands operate the buses according to the schedule and carry more than one million passengers every year. The head office of the company is situated in 9/2, Outer Circular Road, Momen Bagh, Rajarbagh, Dhaka – 1217. You can reach them on TEL: +88 02 8315380. You can also send them to fax by Fax: +088-02-8350003. 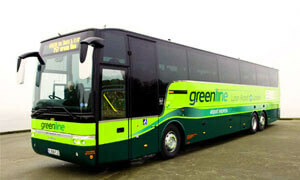 greenline2009@gmail.com is available to contact with the passengers. You can call them on 9339623, 9342580, 8353004, 8353005, 8331302, 8331303, and 8331304 for booking a ticket or complaint against the employees. You can buy your necessary ticket from any counters of Green Line Paribahan. You can also book your seat over a phone call. The manager of the counter will provide your booked seat after your payment. You can also buy Green Line Paribahan online ticket by visiting shohoz.com. Buying a ticket from online is very easy. It saves your valuable time and money. You can buy Green Line Paribahan online bus ticket from shohoz.com. Sohoz.com offers TK 150 off for the online booking. You can visit the website and get TK 150 off. But the biggest offer is to use the app. You’ll get up to TK 300 by using the app. Just download the app and log in to book your ticket. Like Eagle Paribahan, Green Line Paribahan provides international route service. The bus goes to Dhaka to Kolkata. You can find more information by visiting any of the counters across the country. Green Line Paribahan prioritizes the customer satisfaction with safety, cleanliness, modernity and convenience service. The nationwide travel company allows you an uninterrupted customer service with easy connection to the authority. The company tries their best to upgrade and introduce new service for new customer experiences.